Easily one of the most controversial and surprising things about the Tesla Model 3 was its single rectangular 17-inch touchscreen on the dashboard and seeming lack of any physical controls. Surely, we thought, the production car wouldn’t be that simplistic; what about buttons? What about physical controls? But the screen is the real deal, and now we have a good idea how it operates. This video from an Austin, Texas, Tesla gallery was making the rounds over the weekend, but was pulled off YouTube for unknown reasons. But the internet finds a way, and so here’s a mirror you can watch. 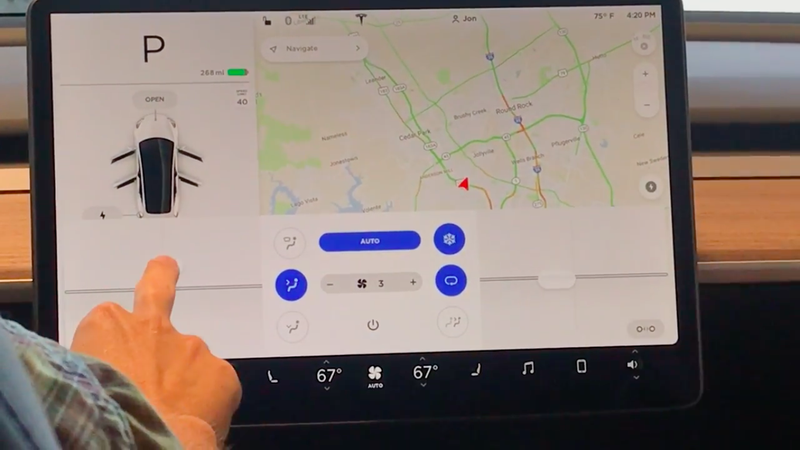 In it two people run through the Model 3's screen controls, reviewing its various features and functions. There isn’t even a gauge cluster in front of the driver—everything works through the screen, which displays the range, map and various vehicle features like the defroster, seat heaters, windshield wipers, air conditioning and stereo. The Model S and X work much the same way. What’s really noteworthy in this video, however, is the apparent lack of FM radio functions on the first Model 3. My theory is that the guys running the video can’t figure out how to find it, because Tesla’s own site lists FM radio (but not AM radio) is an included option, and what new entry-level luxury car wouldn’t at least have FM radio? They do have internet streaming radio, however. We reached out to Tesla to confirm what radio functions it has. The guys in the video also claim that phone audio streaming isn’t available yet on the Model 3 and that this will come with a software update. We’re getting confirmation on that too, but it’s a bit disappointing if it’s true, and one must wonder what prospective customers will think of that. Let us know if you caught anything interesting from the video too.